Yesterday was a snow day for me. We got around 6 inches here, which isn't too terrible, but they hadn't plowed or salted our road at all, so my grandma and I said screw it and stayed home.It was the pretty much the perfect day to lay around in bed and start and finish a short little mystery set on a tropical island. I can't even remember the last Miss Marple mystery I read, so I forgot how much I love her! She's such a sweet little old lady, but she definitely knows how to use her wit and strong conversational skills to get to the bottom of things. Of course I didn't figure out whodunit -- I pretty much never do with Christie's books. She always does a great job of building a cast of characters who are all just shady enough that anyone could be the murderer. 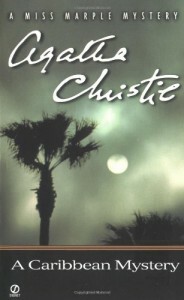 This wasn't the best Christie book I've ever read, but I did enjoy it and I hope to get around to reading more soon. I have a few more Miss Marple books and I think one Poirot, and I'm planning on saving them for future snow days or sick days. Her books are the perfect "curl up in bed and read in one sitting" books.